The Big Give have organised a super garden party at The Manor, Little Compton in Warwickshire and the Birmingham Conservation Trust is going in force! Please come along and join us for the fun. We certainly have something to celebrate: the party is on the afternoon of Sunday 28 July and on the following Monday we will be handing over the keys to the Newman Brothers Coffin Fittings Works, our latest big project, to our contractors so that they can start work. It has taken more than 10 years of hard work, fundraising, breakthroughs and setbacks to get to this point, so we feel a celebration is in order! And that is not all. At the beginning of August we will be launching the BCT’s Supporters Group, with its own newsletter, events, ‘hard hat’ exclusive event at the Coffin Works during restoration and more. If you come to the party you could sign up to our Supporters Group too and help us in our work to save Birmingham’s historic buildings and promote understanding and enjoyment of the city’s amazingly diverse architectural heritage. Simon will be there wearing his (hard) hat as the Trust’s (fairly) new Director, and so will I (Suzanne, Development Officer) and, we hope, many of our Trustees, volunteers and friends (we’ll find a way of identifying BCT on the day!). It is a family event with a brass band, magician, games, splendid teas and much else, so bring the children and invite your friends. The more the merrier! 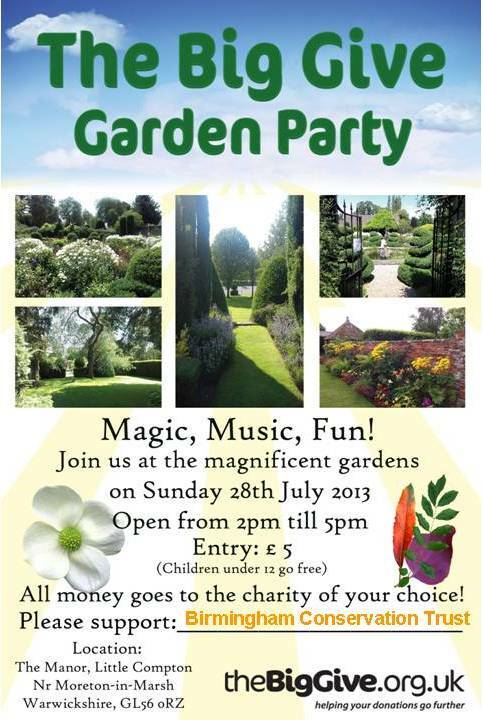 Entry to the party is only £5 (children under 12 go free) and when you nominate the Birmingham Conservation Trust as the charity of your choice the money will go to the Trust. Do come everybody: this is a big moment for the Birmingham Conservation Trust!